On the edge of the Arabian Peninsula, the Sultanate of Oman sits. 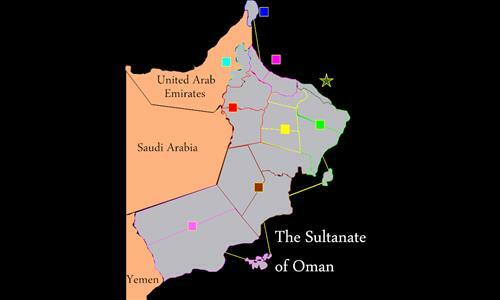 This is a map of Oman and it's regions. Muscat is the capital. Hope you enjoy playing on this map! P.S. This is my first map so I know the drawing isn't perfect and I might not have got it all right, but I thought I did ok for my first map. Thanks for playing my map! Review by barakobama on 8/1/2014. Review by DanWL on 7/2/2014. It would be better if you made a more detailed version of this. How so? Do you mean with smaller territories?